Aquaplaning, or hydroplaning, occurs when the water between your tyres and the road surface cannot be removed quickly enough. 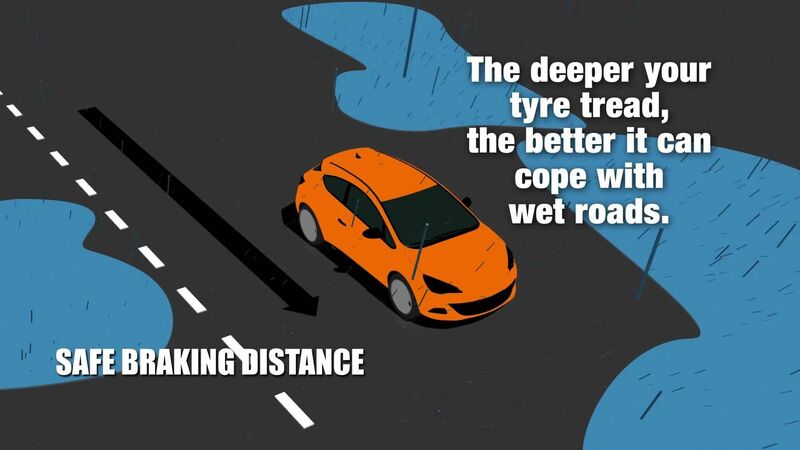 This layer of water builds up in front of the tyres until the pressure of the water exceeds the pressure of the tyre on the road, resulting in the tyres losing contact with the road surface. This loss of traction causes the wheels to slip and prevents the vehicle from responding to steering, braking or accelerating. As a result, your vehicle can go out of control, start to skid or spin. A potentially dangerous situation. How to prevent or reduce aquaplaning Check your tyres and tyre inflation regularly. Insufficient pressure strongly increases the risk of aquaplaning. If tyre pressures are 30% below that recommended then there is a sharp increase in the risk of aquaplaning. Check your tyre wear and tread depth. The more tread depth you have remaining on your tyres the more water you can disperse, reducing the risk of aquaplaning. Reduce your speed. Especially when approaching large puddles or areas of standing water. What causes aquaplaning? The presence of too much water can make your vehicle lose contact with the road surface. A tyre travelling through water pushes a wave ahead of it. When the tyre tread hits the water at the front of the contact patch it increases the water pressure. If it becomes greater than the average pressure of the tyre on the road surface then the tyre won't be able to disperse the water and it will lift off the road surface. The deeper the water and the higher the vehicle speed, the greater the effect eventually affecting road holding. In order for a tyre to perform properly on a wet surface, it must be able to disperse the water to restore dry contact. The groove to water ratio Most potential aquaplaning incidents are prevented by the grooving of the tread and the shape of the contact patch. As your tyre tread becomes worn, however, its ability to resist aquaplaning is reduced. The deeper the water, the sooner you’ll lose traction.